We take our time to make sure we leave your vehicle looking like it’s just left the showroom, both inside and out. 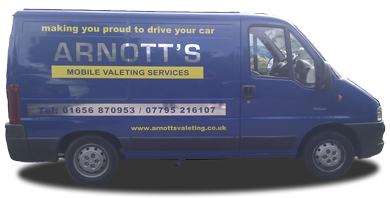 Arnott’s Valeting Services offer a complete mobile valeting service and cover the whole of South Wales. With existing customers such as the Peacocks Group in Cardiff and Nantgarw, Man Truck and Bus UK Depot in Cardiff. Arnott’s Valeting Services is run by Tim Arnott who has over 15 years experience in the motor trade working for Honda, Bentley, Aston Martin, Ford, Toyota, BMW, Mercedes, Vauxhall, Fiat, Seat and Alfa Romeo. Our moto is “Making you proud to drive your car” and that is what we aim to do each and every time. We offer a complete service for cars, vans and lorries and are now accepting all major credit/debit cards on location. Cardiff, Bridgend, Swansea and Newport. © 2019 Arnotts Valeting. All rights reserved.